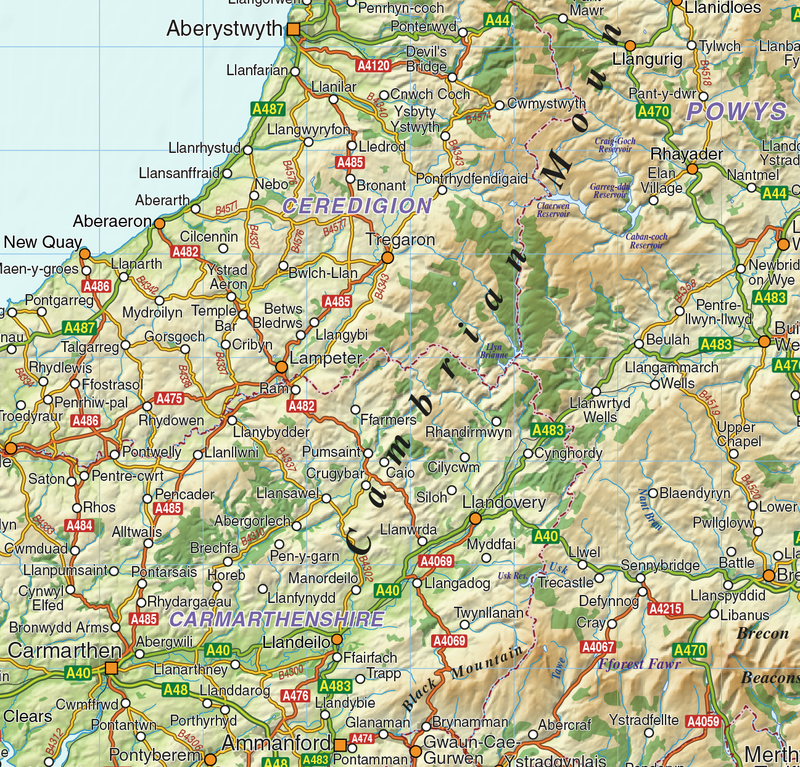 Highly detailed, vector road, rail and relief Wales Map in Illustrator AI CS/CC digital format. Suitable for use up to any size. All text is editable font text. Matches Ordnance Survey data and co-ordinates. Contains County boundaries and fills. 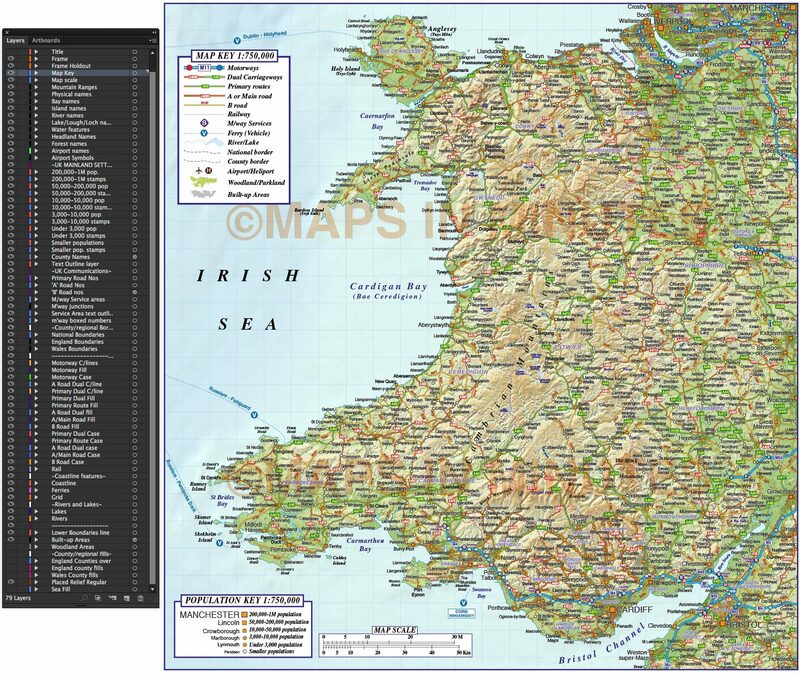 Wales Road & Rail Map in Illustrator AI CS vector format with 300dpi Regular relief tiff option, 750k scale. 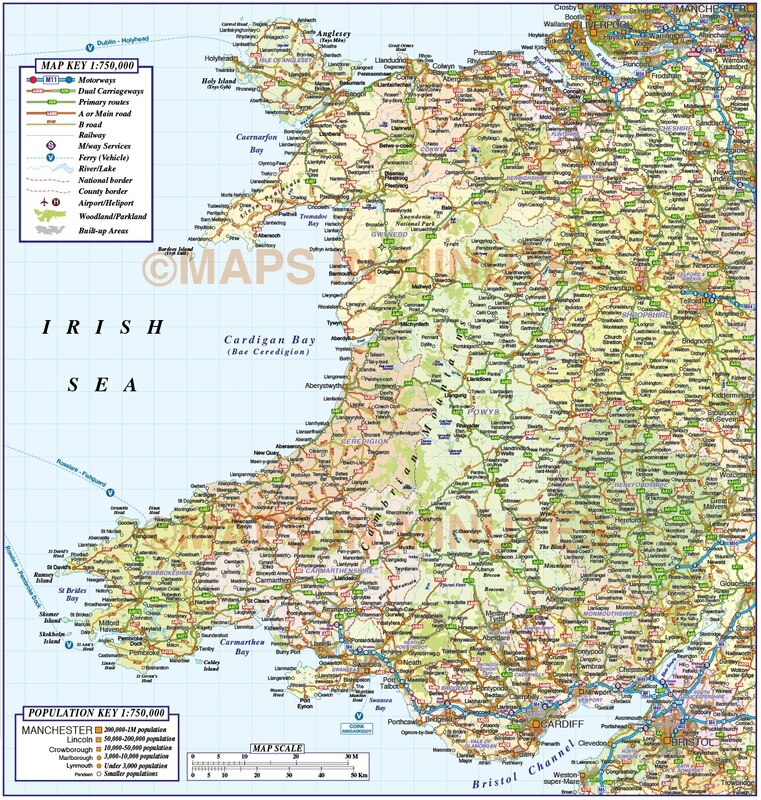 Large up-to-date, highly detailed, 100% editable layered vector Wales map. Suitable for use up to any size. All text is editable font text. Matches Ordnance Survey data and co-ordinates. Contains county admin boundaries and fills so can be used as either a political map, a road map, a relief map or a combination. Layers include: Coastlines, county boundaries, county fills (as separate objects). Settlements layered by population. Road layers include Motorways (including motorway junctions and service stations) Primary routes and 'A' roads (including dual carriageways)), B roads, C and minor roads, comprehensive road numbering, railways, airports and airport names. Physical features include urban areas, forest and woodland, rivers and river names, lakes and lake names, island, bay and headland names, spot heights and symbols. Product also includes a high resolution 300dpi relief background in regular colours as a placed (linked) tiff . Formats: Available Illustrator CS3 (for use with Illustrator CS3 to CS6 or later) or Adobe Acrobat Editable PDF 6.0 format. Our maps in PDF 6.0 format are fully layered within Acrobat but can still be opened and edited in Illustrator CS4 -CS6 while retaining full layering with 100% editability. Our relief tiff files are single layer. Authors notes: This stunning map is updated for 2019 and is the most highly detailed editable mapping available off the shelf. Matches Ordnance Survey co-ordinates and data. A great deal of work has gone into creating what we believe is the best 750,000 scale mapping you can buy today and use immediately. 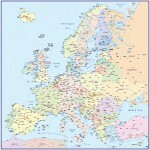 Also available is a set of British Isles map sections, please see our Map Collections category. 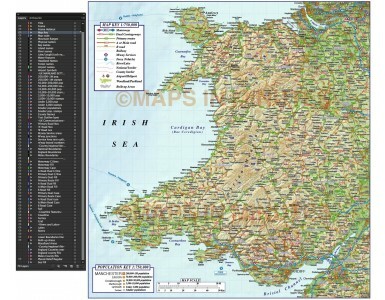 This 750k style map is also available as a complete British Isles map in Illustrator CS6 layered vector document format. If you would like a 750k map created to your custom boundaries this can be ordered. Please use the Contact Us link for a quote or give us a call to discuss.